Although Amsterdam is Europe’s most notorious red light district, that wasn’t always the case. Nestled in the heart of Dublin city on Montgomery Street was Europe’s largest red light district. Shorty thereafter it was given the name The Monto, short for Montgomery Street. There is not much information about how The Monto came to be, we can presume because it was close to the docklands, this is where the majority of their business came. As the famous song goes ; ‘sailors two a penny’. The Monto was not the original red light district of Dublin, that was the suitably named Hell. Located close by where Vaults Live stands today, this area was rampant with prostitution, murder, gambling and crime. Because the area was filled with old medieval alley ways it was the perfect location for the working girls of the time. The police of the time wouldn’t dare enter the area because of the high crime rates. This is something the Wide Streets Commissioners wanted to abolish, and so they did. 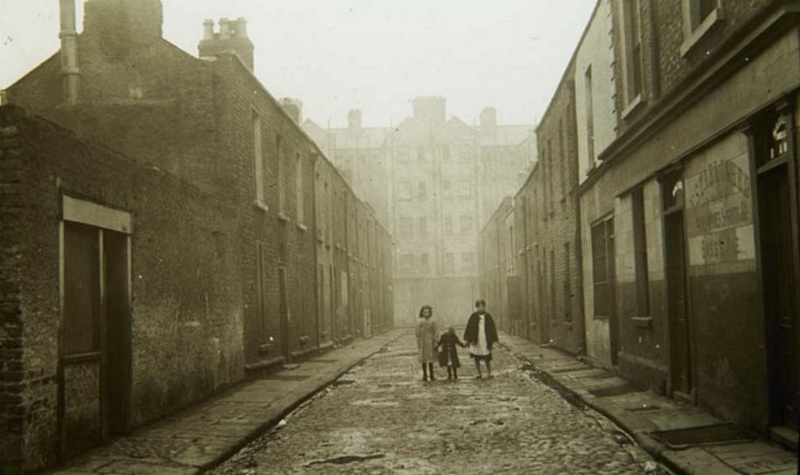 Which led to Dublin’s red light district moving from Hell to Montgomery street. The Monto itself was close by to the docklands which is how the district became so popular and successful. After the abolishment of Hell, this was an obvious destination. Tribes of sailors would stop off in Dublin and be met by the ladies of The Monto. The Monto is also one of the suggested streets where the illusive Molly Malone worked the corner. There is no record of a Molly Malone living in Dublin at the time, but her song has kept her spirit alive all these years. The demise of The Monto was greatly documented as it was a proud moment for the church and the Gardaí, just not the inhabitants. On March 12th 1925, the Garda, along with the church raided The Monto. In doing so they ransacked every building and threw every working girl out onto the streets. Here a few managed to flee but the majority were thrown into the Magdalene laundries. This was their punishment in the eyes of the church for their ungodly sins. The Legion of Mary as they were known at the time. This specific laundry was actually the last known one to close in all of Ireland. The churches and the Garda’s involvement in stripping down the Monto also came about because of the decline in business in the area. As a result of the British having just ‘Packed up their troubles in their own kit bag’. The remaining women took to the streets as they did before the Monto ever existed. This was far more dangerous for the women as they were on their own and vulnerable. This led to the women being beaten, robbed and even forced to perform services without payment, often by corrupt Garda. These women operated across Grand Canal Dock, St. Stephen Green and Phoenix Park, most of which are referenced in the song. If The Monto has peaked your interest, why not come along to the Vaults Live tourist attraction, where you can immerse yourself in the Monto and become part of its history. Without a doubt Vaults.live is the next best thing to do in Dublin. Be sure to view prices to visit and experience Vaults.Live. Is Vaults Live Suitable For Families?